This product allows you to easily see your dog even during nighttime or under poor lighting conditions. If you are taking your dog for a walk in the evening, it keeps vehicles and people from accidentally hitting your pet. The leash light is compact, water-resistant, sturdy, lightweight and will not easily fall off even with frequent movement. It emits light streams like a flashlight. However, it has no feature for blinking, flashing or glowing lights. Also, it posts a choking hazard in case it is accidentally swallowed. Aside from light-emitting charms, another option is to have a charm that produces sound. Coastal Pet Products 3-Pack Li’l Pals Round Dog Bells is one of the available choices in the market. The cute bells are small, lightweight and can be easily attached to any dog collar. They can alert you on what your furry friend is up to. However, small as they are, these bells do not produce disturbing noise. When you buy this item, each pack contains 3 charms. This charm is sturdy, durable and has a distinct design that will look great on any dog. 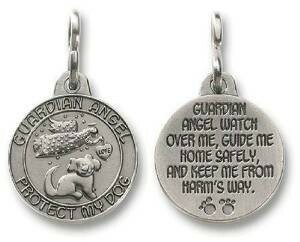 What’s unique about this charm is that it has an embossed prayer that asks for protection for your pet. This is one of the 10 best dog collar charms that has received many favorable comments. 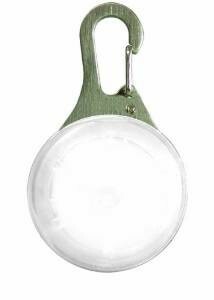 Keep your furry friend safe at night with this light charm that has an affordable price tag. It can quickly and easily attaches to any collar. You have the option to set it to emit a solid or flashing signal for easy visual. While it is great for larger dogs, it can be a bit heavy for smaller breeds. Some users also remarked that it has a short battery life. This bell charm pendant is chrome-plated and will not easily rust. When you order it, you get two sets of pendant with two bells each. Its clasp is big enough for most size D rings. Its easily distinguishable sound is loud enough that you can hear it at a far distance without getting too noisy. Most buyers say that it is great for training dogs. Your pet will look cuter with this one on. Believe it or not, this product has a powerful light that can be seen up to half a mile away. It is great for after-dark walks and camping in the wilderness. In case your dog gets lost, this charm can help you in locating your pet. In addition to that prominent feature, it is also sturdy, water-resistant and has a stainless steel fastener. It can work up to 30 hours with steady on, slow flash and quick flash settings. 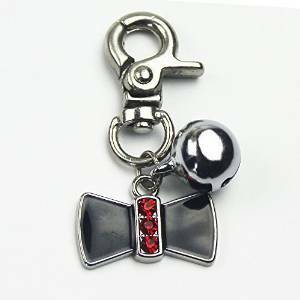 Another item in the 10 best dog collar charms that really looks cute on dogs is this bow-tie pendant with red and shiny crystals. It is chic and stylish and ideal for fashionable owners like you. It is compact and not too heavy even on small breeds. This item is silver-plated and does not rust easily. Its clasp can fit most size D rings. This stylish LED collar light charm is a good buy. It can keep your pet safe during after dark walks. Made from durable plastic, this charm is lightweight and is decorated with attractive jewel crystals. The LED light can be easily turned on or off with a simple twist. It is reliable in keeping your dog visible in the park or anywhere you are. The main drawback though is its short battery life, a problem that is common among battery-operated devices. This bone-shaped charm is also among the 10 best dog collar charms. If you love to take your dog for a walk in the night time, this charm is beneficial for you. It can make your pet visible even in a poorly lit area. It will allow cars and people to see your dog even from a far distance. Moreover, it helps pet owners easily locate their dogs that are playing in the backyard. You could easily buy this product which is one of the 10 best dog collar charms available. This charm can be easily attached to the collar. It is sturdy, lightweight and available in attractive colors. It is definitely stylish. It also does not produce annoying sounds. dog collars and charms work together to keep your dog safe. According to Cesar’s Way, illuminated collars are a great way to keep your furry friend safe at night. Undoubtedly, light and sound producing charms offer numerous benefits more than giving your pet a stylish and cute look. It’s good to see several sound or light producing charms in our 10 best dog collar charms list. They are some of the best in the market because of their cost-effectiveness and unique features.